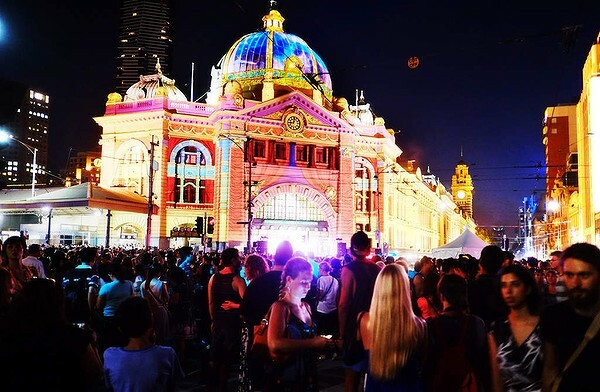 MELBOURNE'S inaugural all-night cultural festival White Night attracted a crowd of more than 300,000 people to the city centre, organisers say. Artistic director Andrew Walsh he was extremely pleased with the turnout and the behaviour of those who attended. "What we saw last night was a city transformed, a crowd beyond our wildest imagination and experiences to match," Walsh said. "No city in Australia has ever seen anything like White Night." _______________________________________________________________ The city was absolutely packed with people, a very, very popular event! Unfortunately I didn't have my camera with me, so I'm hoping someone on this forum did attend with camera and can post some photos for us. Almost 600,000 people took to the streets of Melbourne overnight for the fifth instalment of White Night Melbourne. The city was transformed into a creative wonderland that saw giant rabbits and jellyfish move in to the Alexandra Gardens, sea dragons swimming under the State Library dome and a flame-throwing musical instrument straight out of Mad Max take over the plaza at Melbourne Museum. Visitors took part in more than 120 free events including live music marathons at Federation Square and the Bourke Street Mall, pop up cinema on Lonsdale St, ballroom dancing on Collins St and world music at Birrarung Marr celebrating the 140 cultures that call Melbourne home. Projections enlivened city buildings and inside people burned the midnight oil while taking in exhibitions such as David Hockney and Victor&Rolf at the National Gallery of Victoria, the 40 years of Triple R at State Library Victoria, ACMI’s Screen Worlds and the new children’s gallery at Melbourne Museum. The expanded northern precinct around Carlton Gardens, and southern precinct around Alexandra Gardens helped to keep crowds moving and Victoria Police reported no major incidents. Melbourne hotels reported a surge and restaurants, cafes and bars and retailers also stayed open with attendees injecting millions of dollars into the economy. White Night Melbourne 2016, attended by 580,000 people, brought in $16 million. The event was the first White Night to be delivered by Melbourne-born dancer, choreographer and producer, David Atkins, the mastermind behind spectacular international events such as the opening and closing ceremonies for the 2000 Sydney Olympics and the 2010 Winter Olympics in Vancouver. A brand-new winter festival will descend on Melbourne in 2019 as the city’s unmatched music and cultural offerings are celebrated at a signature event unlike anything Victoria has ever seen. Bringing Melbourne’s iconic after-dark experiences to life, the Andrews Labor Government’s new initiative will incorporate the hugely successful White Night Melbourne which will be relocated from its existing February timeslot. On top of that, the event will feature a broader multi-day program that cements Melbourne’s reputation as a vibrant, creative, 24-hour global city. Melbourne’s best will be on show at the mid-year extravaganza, with longer nights in winter giving artists more hours to inspire and earlier start times making the event more accessible to families. Music will be a pillar of the event with support from an innovative program of experiences that features design, film, food, performance and street art from Australia and overseas. The reimagined winter event will build on the expanded White Night of 2018, which included live performance, music, food and culture experiences to make it the most successful one-night cultural event on Melbourne’s enviable event calendar. The first iteration of the three-day event will be held in August 2019. Timing and program details will be released in the lead up to the event.